Cryptid Cinema: The Movie-land of Sasquatch, Bigfoot, Bayou Beasts, Backwoods Bogeymen and Bloodwater Brutes! Stephen R. Bissette is very well-regarded as a legendary comic book artist, writer and publisher, hi smost notable credit was as the artist on Alan Moore’s run of Swamp Thing and the co-creator of Constantine. 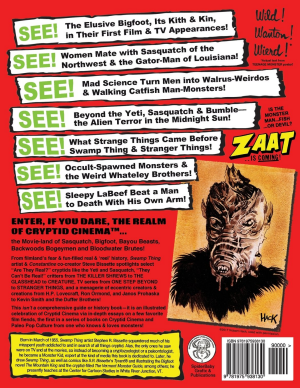 In his new book, Cryptid Cinema: The Movie-land of Sasquatch, Bigfoot, Bayou Beasts, Backwoods Bogeymen and Bloodwater Brutes!, he presents an astonishing, fully-illustrated menagerie of monstrosities, curiosities, and wild & woolly weirdos from the 1950s to the present day.In these pages, you’ll find celluloid and TV incarnations of ‘real world’ cryptids like the Yeti, Sasquatch, and the Jersey Devil plus movie creatures and television monstrosities. 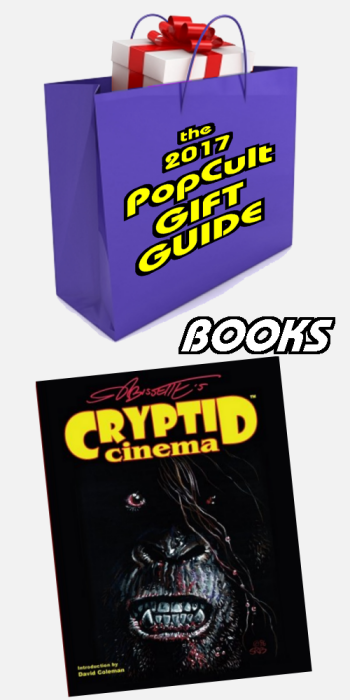 Cryptid Cinema covers cryptid appearances in TV series from ONE STEP BEYOND to STRANGER THINGS (offering a complete ‘study & viewing guide’ to the first season), as well as comic books, toys, action figures, and other media. In these pages, you’ll meet a host of eccentric creators like (and the creations of) H.P. Lovecraft, Ron & June Ormond, Jerry Warren, Arthur C. Pierce, Virgil W. Vogel, Janos Prohaska, and others, on up to today’s trail-blazers like Kevin Smith, Stefan Avalos, Lance Weiler, and the Duffer Brothers! This isn’t a comprehensive guide or history book—it is an illustrated celebration of Cryptid Cinema via in-depth essays on a few favorite (and often long-forgotten) film fiends, designed and written for older readers (there is some mature content in this first volume, given the nature of the 1960s and 1970s Bigfoot novels, movies and comics). Independent filmmakers and low-budget ‘grindhouse’ and drive-in exploitation features are given special attention, as are the first-ever Bigfoot documentaries. Readers will learn about the classic stop-motion animation ‘amateur’ movie, Equinox; the behind-the-scenes secrets of the rare direct-to-video Upper New York State gem, The Glasshead; the backstories behind the Swedish-American extraterrestrial Yeti opus, Terror In The Midnight Sun; the made-in-Florida Walking Catfish-Man epic Zaat, (AKA The Blood Waters of Dr. Z); and the surgically-created Walrus-Man movie, TUSK. Stephen R. Bissette, a pioneer graduate of the Joe Kubert School, teaches at the Center for Cartoon Studies. Renowned for Swamp Thing, Taboo (launching From Hell and Lost Girls), ‘1963,’ S.R. Bissette’s Tyrant®, co-creating John Constantine, and creating the world’s second ’24-Hour Comic’ (invented by Scott McCloud for Bissette), he writes, illustrates, and co-authors many books, include illustrating The Vermont Ghost Guide and The Vermont Monster Guide, writing Teen Angels & New Mutants, and contributing short fiction to Hellboy: Odd Jobs, The New Dead, Mister October, etc. Bissette co-authored Comic Book Rebels, Prince of Stories: The Many Worlds of Neil Gaiman and The Monster Book: Buffy the Vampire Slayer, and regularly writes for Monster! and Weng’s Chop; this book is his first, self-published volume of Cryptid Cinema™ and he is currently completing the Midnight Movie Monograph for Electric Dreamhouse/PS Publications on David Cronenberg’s The Brood; he’s also hard at work on his first art instructional book series, S.R. Bissette’s How to Make a Monster. Required reading for any fan of monster movies and fantastic creatures, Cryptid Cinema: The Movie-land of Sasquatch, Bigfoot, Bayou Beasts, Backwoods Bogeymen and Bloodwater Brutes! is available as a print-on-demand book directly from CreateSpace. As I write this, they are offering it at a discount. Chances are, you have someone on your holiday gift list who will love this book.